Connected Learners seem to find each other– we gather together to learn from each other about similar interests and passions. 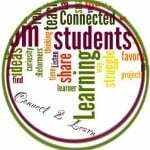 Click here to link to other CLmooc blogs, join the ring, or learn more. Wowser! It’s another day! What else could we do today? What Else? That’s the question to ask, to be curious, to engage more fully in whatever you are doing. And, “What Else?” is the question to ask when writing or creating — the thinking behind doing. What Else? What detail, event, verb, description, structure, feature, etc. could I add to engage my reader in a mind movie, to inspire my reader to question, reflect, argue, and read on? This blog shares my own thoughts, my own imperfect, learning journey, as I ask “What Else?” – even in retirement. We are all learners; please be patient with us. Students today enjoy the connectedness of social networking; it is part of their very being. My goal is to bring my instruction into that cloud to teach the content required in ways that inspire online responsibility and ethics in this new, very public world. In addition, as I connect with other educators about the emerging issues and pedagogy of connected learning, I reflect here on those issues, pedagogy, and connections that make for a diverse dialogue about what education could be. These are my reflections. Please remember we are all learning. Neither my words nor those of my students represent our school district, and our words belong to each of us as we strive to become better learners. I am learning together with my colleagues in my professional learning neighborhood as my students are also learning together as they build their neighborhoods and practice digital citizenship. Receive a weekly digest of new posts by email. Copyright © 2019 What Else. All Rights Reserved. Magazine Basic created by c.bavota.